description for "Winter Squash and Pumpkins: Cucurbita pepo, 'Royal'"
Cucurbita pepo, 'Royal'are high-yielding vines that produce dark-green, deeply ribbed fruits that turn orange when stored. 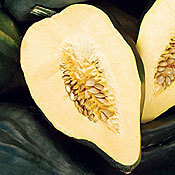 This acorn squash has moderate sweetness and fine, dry flavored flesh - exquisite when baked. Planting depth: .5-1 inch. Days to germination: 3-8 days. 85-95 days to maturity. reviews for "Winter Squash and Pumpkins: Cucurbita pepo, 'Royal'"